In 3-quart saucepan, cook beef, onion and garlic over medium-high heat about 8 minutes, stirring occasionally, until beef is brown; drain. Stir in remaining ingredients except beans. Heat to boiling. Reduce heat to low; cover and simmer 1 hour, stirring occasionally. Stir in beans. Heat to boiling. Reduce heat to low; simmer uncovered about 20 minutes, stirring occasionally, until desired thickness. 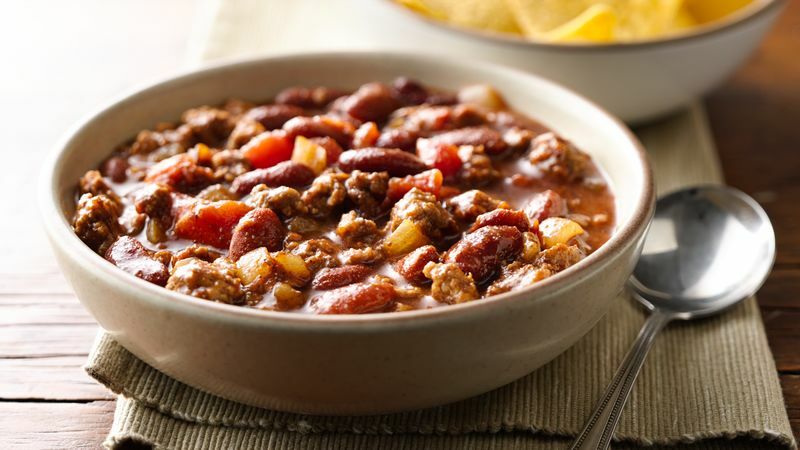 Here's a new way to top off your chili! Sprinkle shredded Cheddar cheese over individual servings of the hot chili, then drizzle with a little ranch dressing and add a few chili-cheese-flavored corn chips.